�����The metals have been hit hard in the last couple of weeks. Gold is down over $180 since last week's report, currently just over $1,600. Silver has fallen all the way back to $30.40. There appears to be some panic among investors and automated "sells" in the commodities market has chased falling prices to even lower levels. For some, this could be a great opportunity. Otherwise, it may be best to wait on the sidelines. Despite a lower Gold price, the 2009 UHR's are still in tremendous demand. Supplies are very thin and dealers have some strong buys for the MS69 and 70 grades including Prooflike coins. The MS69's are now at $2,550 wholesale. �����It should not come as a shock that this week's HD Wholesale Market Dealer Price Guide is covered with declines in the various Gold charts. With Gold down over $200 since the last HD issue, September 7th, all the common date Twenties are lower in Good through MS65. Premiums have also stumbled as supplies linger in the marketplace. Saints are now listed at $2,280 in MS65 and should be a little lower after today's downturn. Even though the market for common dates looks bleak, collectors of better date $20 Liberties are in hot pursuit. The combination of low original mintage and low populations for the grades has created competition for many of these dates. �����The 1864 $20 Liberty now has a Market value of $150,000 in MS64. 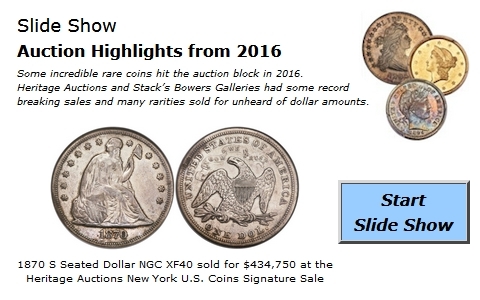 The 1866 S No Motto is higher in MS60 and 61, now at $195,000 and $265,000, respectively. The MS61 is the highest grade with a price listed. Carson City Twenties remain high on want lists and the highest grades for the dates are easy sellers when they are offered at major auctions. The 1882 CC is now at $20,250 in MS62 and the 1885 CC in the same grade is higher at $28,250. Also, the very rare 1886 increased in AU58 through MS61; MS61 has jumped to $89,500. In addition, the market for Proof Gold is heating up with several dealers trying to accumulate as many coins as possible at current levels.